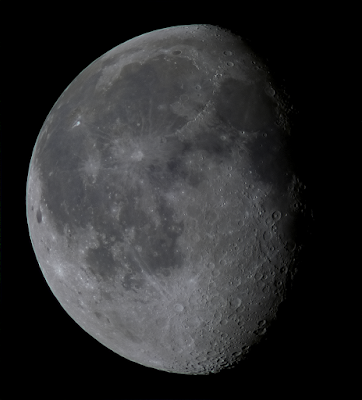 A tripod mounted Panasonic Lumix DMC-FZ72 bridge camera at 60x optical zoom was used to image the 81% waning, gibbous Moon. The camera was set to ISO-100 and 1/500s exposure at f/5.9. 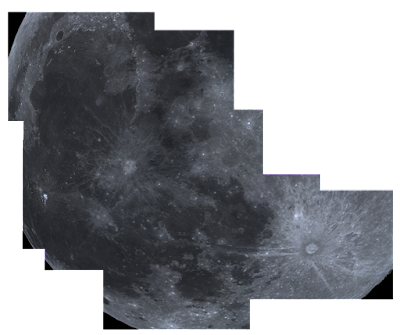 186 images, were precisely cropped in Nicola Mackin's AstroCrop for Linux software and the cropped images were stacked in Autostakkert! 2.6 running in Wine on a Linux Mint laptop. The final 16 bit TIFF file was wavelet processed in Registax 5.1 running in Wine, and was post processed in the Gimp 2.9. Click on the image to get a closer view. A ZWOASI120 MC camera was placed at the Cassegrain focus of a Skymax 127 that was mounted with extra counterweight on an iOptron Cube Pro, AZ, GOTO mount. 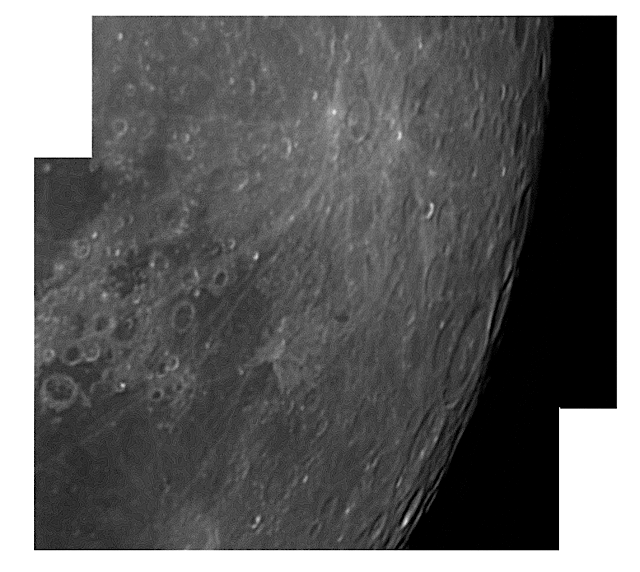 Nicola Mackin's AstroDMx Capture for Linux was used to capture a 5000 frame SER file using a 320 x 240, manually tracked ROI. The best 20% of the frames was stacked in Autostakkert! 2.6 and wavelet processed in Registax 5.1 both running in Wine. The final image was processed in the Gimp 2.9. A Skymax 127 was mounted with extra counterweight on an iOptron Cube Pro, AZ, GOTO mount. A ZWOASI MC camera was placed at the Cassegrain focus. 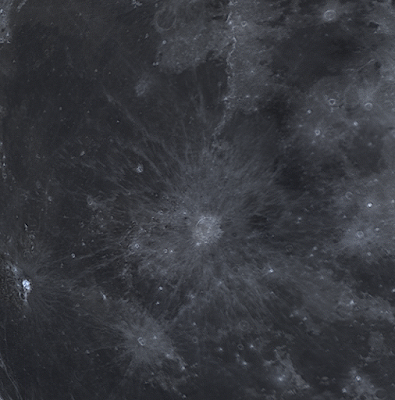 Nicola Mackin's AstroDMx Capture for Linux was used to capture nine, overlapping, 1000 frame SER files of the Moon. The best 80% of the SER frames were stacked in Autostakkert! 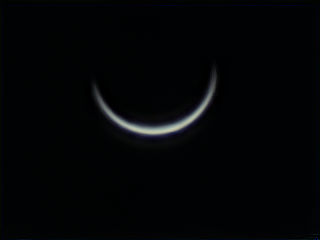 2.6 in Wine and the resulting images were wavelet processed in Registax 5.1 in Wine. The nine panes were stitched together using Hugin Panorama Creator. The final mosaic was processed in the Gimp 2.9. Click on the image to get a closer view. A Skymax 127 Maksutov was mounted on an iOpton Cube Pro, AZ, GOTO mount with extra counterweight. A ZWO ASI120 MC camera was placed at the Cassegrain focus and AstroDMx Capture for Linux was used to capture a 20,000 frame SER file with a manually tracked Region Of Interest (ROI) of 320 x 240 pixels at at frame rate of 250 frames per second. The SER file was loaded into Autostakkert! 2.6 in Wine and the best 10% of the frames were stacked. 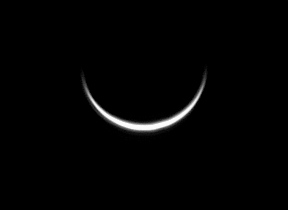 The resulting 16 bit TIFF file was wavelet processed in Registax 5.1 in Wine and the final image was post processed in the Gimp 2.9. Automatic RGB alignment in Autostakkert! fully corrected atmosphric dispersion. 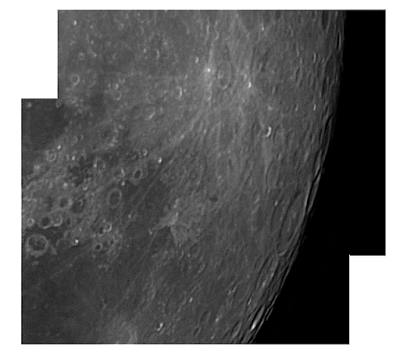 The manually tracked ROI is a new experimental feature in AstrDMx Capture for Linux, and will eventually be made fully automatic. By using a 320 x 240 ROI, it was possible to achieve very high frame rates. This meant it was possible to capture 20,000 frames in 80 seconds. As a result of capturing this very high number of images, 90% could be discarded by Autostakkert! and the remaining 2000 frames stacked to produce the final image.